Why Is Your Washer Leaking? A puddle in the laundry room almost always means that your washer is leaking. Fortunately, some of the puddles mean only a minor repair is needed; others indicate a bigger problem. No matter the reason or the brand of your washer, every leak needs to be investigated and repaired before the puddle becomes a flood. It is helpful to note the location of the puddle in determining the cause. However, water does flow and gather at the lowest point in the area. 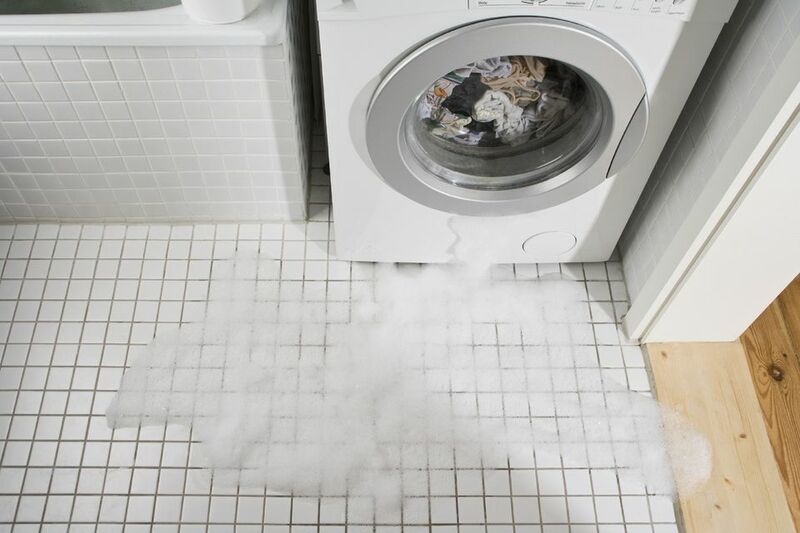 If your washer or floor isn't level, the leak may not be happening directly above the puddle. Be sure your washer is level before you tackle a leaking problem. While some leaks have universal causes in both front-loading and top-loading washers, these tips will help you identify the problem depending on the type of washer in your laundry room. Once you've pinpointed the source of the leak, you may be able to do the repairs yourself. Leaks at the front of a top-load washer are usually caused by a clogged or tilted overflow tube. Clogs can happen from excess suds caused by using too much detergent or combining laundry products inappropriately. Oversudsing can easily happen in homes that have a water softening system. With softer water, less detergent is needed for effective cleaning. To test if you are using too much detergent, take a freshly washed item, like a small hand towel, and place it in a bowl of hot water before drying. If the water becomes sudsy, you are using too much detergent. The washer can leak if it is overloaded or out of balance. Check to be sure the washer is level, reduce load sizes, and keep an eye out for the leak. You may have solved the problem. If you have a washer that features a spray rinse function, interfering with the cycle by manually advancing the timer can cause the washer to leak. The manual advance can often cause the spray rinse cycle to go on too long and overflow. If your top-load washer is new, you may have forgotten to remove the manufacturer's drain plug before installing the drain hose. Remove the hose and you'll find a plastic plug that must be removed and discarded. Have a bucket and towels ready to catch the excess water. The leak at the back of the washer can also be caused by a drain hose not properly secured in the drainpipe. Be sure that the hose is fully inserted into the standpipe (drainpipe). If there is still a leak around the drain hose, especially during the washer spin cycle, the drainpipe is probably clogged. The clog is not allowing the water to continue down the pipe and causing it to back up and overflow onto the floor. Another possible cause for a leak at the back of the washer is a loose connection at the fill hoses. Turn off the water supply and remove the hoses and check that the rubber washers are in good shape or if they are even there. Skipping the use of rubber washers is common and can cause leaks. If after replacing and hand-tightening the connections there is still a leak; replace the fill hoses. There could be a pinhole leak that will soon erupt into a flooding of your floor. A leak under the washer indicates a hole in the water pump. It should be replaced immediately to prevent water from falling directly on the motor. Water + Motor = Failure. If you are handy, you can find a repair manual for your washer model and replacement parts. Overflowing: Overflowing is hardly a leak but it is a problem usually caused by a water valve or pressure switch problem. Time for a repair! A leak can also occur if the door is not closing properly. The hinges can be loosened and readjusted to be sure that alignment is correct. The same problems that occur on a top-load washer with the drain hoses and inlet water hoses can happen with a front load washer. Follow the tips listed above to identify and repair the leaks. A front load washer can also leak in the back overflow area due to too many suds. You must always use HE detergent in a front loader and only use a small amount. A front-load washer has an inner and outer drum. In many washers, the outer drum is manufactured in two halves and then bolted together. These seams can begin to leak and will need to be replaced or repaired. Does Your Washer Dance More Than You Do?